The Stanley no. 61 and no. 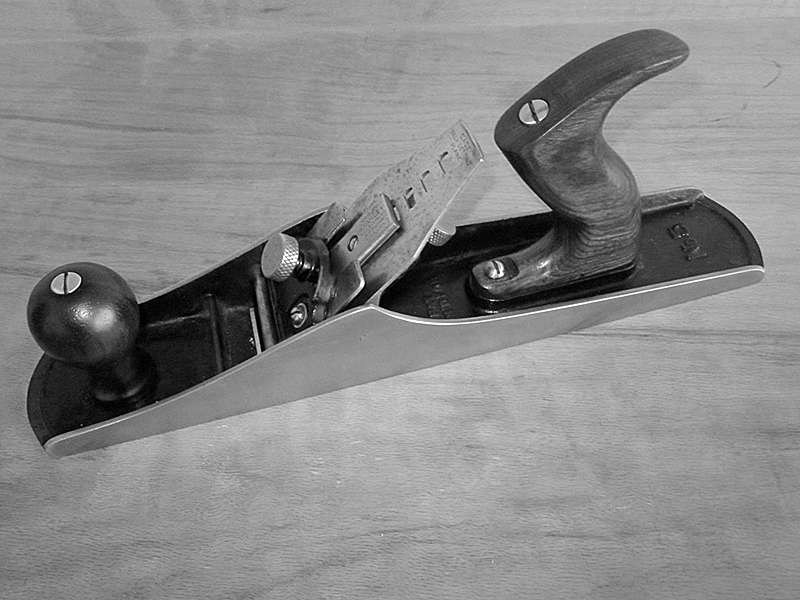 63 planes are low angle block planes featuring depth adjustment mechanisms but lacking an adjustable throat plate. Introduced in 1914 and 1911 respectively, neither the 6 inch no. 61 nor the 7 inch no. 63, were ever particularly popular with tradesmen, woodworkers, or carpenters. Offered as less expensive, fixed throat alternatives to the no. 60 and no. 65, very few folks were tempted to purchase a low angle plane without an adjustable throat, especially when that feature could be had for just a few pennies more. Subsequently, their limited popularity constricted demand and production, and so they are fairly hard to find today. Ironically, these planes are virtually identical to the very first type no. 60 and no. 65, both of which were introduced in 1898 with a similar wooden knob and lacking an adjustable throat. Why then, less than 10 years later, Stanley thought reintroducing this handicapped design under the model nos. 61 and 63 was a good idea is anyone’s guess. Regardless, both the no. 61 and no. 63 are easily distinguished from the Type 1 no. 60 and 65 since their model numbers were cast in relief at the rear of the bed just below the depth adjustment knob. Manufactured for less than 25 years, both planes were discontinued in 1935. While the no. 61 and no. 63 are very collectible due to their scarcity, users looking for a functional low angle block are far better off sourcing a no. 60 or 65 in good condition. 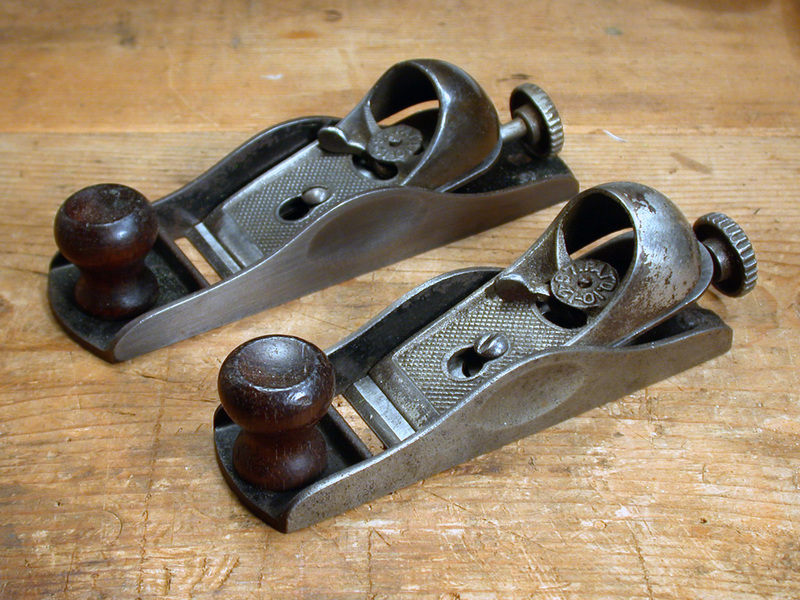 John Porcius Gage formed the Gage Tool Co. in 1883, and operated it until 1917, making wood bottom transitional planes. J.P. Gage registered plane patents on 4 August 1885, 13 April 1886 and 8 November 1892. The 30 January 1883 patent of David A. Ridges was also used. The Gage “self-setting” design eliminated the need for a lateral adjustment feature, which eliminated slop in the blade movement. The adjustment slide was designed to accurately fit into a groove in the frog, and depth adjustment was controlled by a screw at the rear of the frog, similar to a low angle block plane. The two-piece lever cap design also functioned as a chipbreaker. The outer part of the cap serves as the lever cap, with the inner piece functioning as a chipbreaker. The mechanism is adjustable via a two-screw slide to bring it closer to the edge of the blade. The self setting feature allowed the cutter and cap to be removed and reinstalled without adjustment of the cut. In 1919 Stanley Rule & Level Co. bought the Vineland NJ company, mainly to get the patent for their excellent frog design and to compete with Sargent’s Auto-Set line of planes that are very similar in both appearance and design. 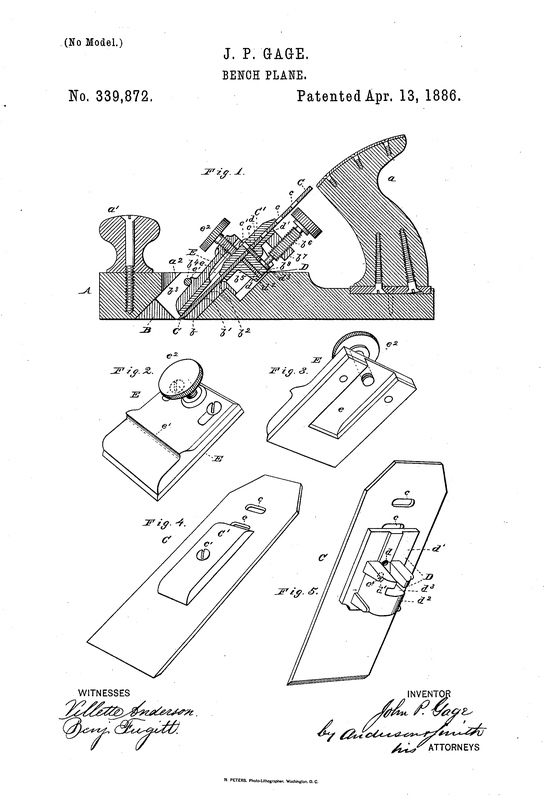 Stanley retained the use of the Gage name, producing a line of transitional planes from 1919 to 1935, and metal Gage planes from 1919 to about 1941, when the line was phased out. The original Stanley Gage line of metal bench planes was numbered 3 through 7, sizes that compared to their Bailey counterparts. The G prefix was added in 1930 to distinguish them from the Bailey line (G3 through G7C). There were 10 different numbers included in the offering, which included corrugated versions that, like Bailey planes, were differentiated with a C suffix appended to the model number (ex. G3C or G7C). There are four “Types” of Stanley Gage planes, which are thankfully far less complicated than most of the other Stanley Type studies. Type 2 (1924-1930) – “Pat. Appl’d For” removed from the casting. Plane beds are now marked with Schade’s 2-17-20 patent date. Type 3 (1930-1941) – The “G” prefix added to the model number. Sellens, Alvin, The Stanley Plane,: A History & Descriptive Inventory, Augusta, KS: Allvin Sellens, 1978. Walter, John, Stanley Tools: Guide to Identity & Value, Marietta, OH: John Walter, 1996. There are definitely artistic elements to restoration, and while mostly technical, I would argue that compositional elements also come into play in an unconventional sense. It’s very much like creating something with found objects. I approach restoration projects with the objective of finding the fine, although often fuzzy, line between age and damage, removing the latter while keeping the former. Instead of graphite, ink, or paint, the media used here were a variety of abrasives, lubricants, and chemicals that effect specific desired changes in metal and wood.